So I’ve decided that I will be recapping the Korean drama ‘Let’s Eat’ from now on, as I think this drama is a really underrated drama that no other drama recapping site is taking note of and as a way to start this blog. I have been watching this drama for the past six weeks and although it’s a bit slow and boring, there are still scenes that makes this whole drama worth watching. Fortunately the drama is starting to pick up so things are getting interesting. There are six episodes out so far (one episode every Thursday) and I will hopefully, hopefully, continue to recap the drama (unless I’m too busy or I start losing my interest in this drama, as that is what happens often). If I happen to do drop this drama, I’ll tell you guys ahead of time and hopefully you guys will forgive me. Sounds good? Okay! Let’s get started! 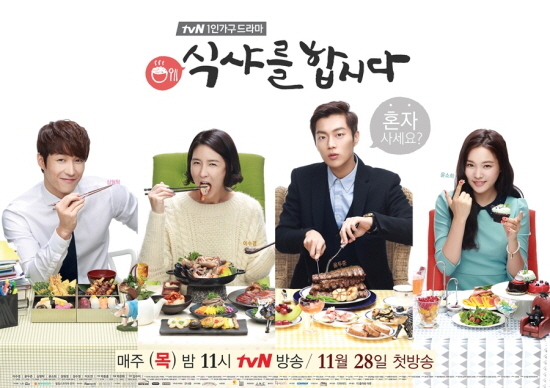 ‘Let’s Eat’ airs once every Thursday on tvN and has 16 episodes overall. Storyline (credits to Asianwiki): Let’s Eat depicts the daily life and romance of a single woman and a murder case that occurs in her neighborhood. Lee Soo-Kyung (Lee Soo-Kyung) is a 33-year-old single woman who lives alone in an apartment since her divorce. She always wants to carry herself with dignity, but she loses self-control when she is near gourmet foods. Koo Dae-Young (Yoon Doo-Joon) is a gourmet, especially talented with describing the taste of foods. He often lies when he opens his mouth, but he is usually considerate to others. Yoon So-hee plays Yoon Jin-Yi who decides to live by herself so she moves in an apartment next to Lee Soo Kyung and Koo Dae-young. She learns about the importance of living by one’s self through the struggles she faces by making sacrifices and leaving behind a household full of wealth and money to experience independence. Kim Hak-moon is a lawyer who used to have a crush on Lee Soo-kyung. He is also the boss of not only Lee Soo-kyung, but Oh Do-Yeon and Choi Kyu-sik, two workers who also work in the same office as Lee Soo-kyung. Lee Soo-kyung’s best friend is Park Kyung-mi who is also married to Choi Kyu-sik. Kyung-mi often gets into arguments and fights with her husband so she resorts to Soo-kyung for help and comfort. The drama starts out with a woman named Lee Soo Kyung (Lee Soo Kyung) who introduces herself as a divorcee to a man sitting on the opposite side of her, who we assume is her blind date. She doesn’t seem to be approving of him as she states that she has no interest in getting married and only came out because she was doing her friend a favor. As her blind date suggests that they go watch a movie, she makes up the excuse that she’s watched every movie he suggests just to avoid going to the movies with him. The two then agree to go to a restaurant together where Lee Soo Kyung tries to entertain her blind date while waiting in the busy line. She states that she can never eat alone and especially at a “mat-jib” or a popular restaurant where there’s usually never a person eating alone so she seems to be very grateful to have a partner eating with her. She can’t help but feel tempted when she sees the dishes being served to different customers. However, just when she feels excited about almost having the famous dish (that includes crabs and shrimps), her blind date abruptly states that he’s allergic to shellfish. He decides to leave since he can’t even eat the special dish anyways. After failing to get his attention once he walked away, she tells the waiter that she’s the only person who’s eating. She sits awkwardly by herself while waiting for her dish, pretending to call someone as if they were going to join her. She debates as to whether she should leave because of all the embarrassment but once she sees the dish, she changes her mind and stays. When Soo Kyung finds out that a small dish serving is enough for 3~4 people, she makes up the excuse that her boyfriend isn’t coming to leave. Upon arriving at her apartment, she sees two ambulances parked outside and once she enters her apartment building, the woman that had lived next to her in Room 804 supposedly died from choking while eating an octopus. She gets questioned by the police about her relationship with the woman in 804 and reveals that she was not close with the woman nor did she hear anything strange. A month since the accident passes and the next scene transitions to showing a man playing games on his cell phone. The man is none other than my fabulous and very handsome Yoon Doojoon, who goes by the name of Goo Dae Young in the drama! He loses on the game so begins his daily routine by dancing to B2ST’s ‘Shadow’ [!!!]. IN In the next scene, Goo Dae Young talks to a girl name Hyo Shin on the phone, receiving a disapproving look from his neighbor Lee Soo Kyung. He first visits the convenience store and dry cleaning shop where the owner complains about how he always leaves his clothes at the shop. Goo Dae Young defends himself by stating that he feels more comfortable just switching clothes at the shop itself. While he exits out of the shop looking amazing and fabulous like usual, the camera focuses in on this young, pretty lady named Yoon Jin Yi (played by Yoon So-hee) who will be moving in to Room 804 since the former owner had just died. The young lady also learns about the former owner and states that her dream was to see always see a ghost. Pretty weird eh? She greets her next door neighbor Lee Soo Kyung then takes notice of Lee Soo Kyung’s dog, saying that her dream was to always raise a dog (she has a lot of dreams…which is never a bad thing). Lee Soo Kyung shrugs everything off and enters her apartment. Later on that night, Jin-yi hosts a small party with her friends, preparing to bid farewell with them as she prepares to move in to Apartment 804. She states that while living in the hotel was comfortable, she doesn’t plan to stay there anymore because her dad who is currently in jail is taking too long with his case. Her mom is also living with her uncle in the states because she’s sick so Jin-yi decided that the best thing to do was to settle down by herself. Goo Dae-young is seen talking on the cell phone with yet another woman while taking out the trash that also happens to be leaking. Lee Soo-kyung who is planning to walk her dog, Barassi, also exits out of her apartment at the same time as Goo Dae-young is taking out his trash. She enters the elevator with him and glares at him while he converses with the woman on the phone. A few seconds later, they both discover Barassi licking the trash bag to where Lee Soo-kyung apologizes and says that she’ll clean the mess that Barassi made up. Unexpectedly Goo Dae-young just bluntly states, “Go ahead” and walks out of the elevator like nothing. HAHAHAHA. Freaking Goo Dae-young, you would. After cleaning up the mess made in the elevator, she notices the liquid that was leaking from Goo Dae-young’s garbage bag earlier and notifies him about it. But all he does is just smile and says that he’ll clean it up. LOL, I love Goo Dae-young already :3 (yes I’m being a bit biased here). We are then introduced to Kyung Mi, Lee Soo Kyung’s best friend. Kyung Mi asks for Lee Soo Kyung to come to her house, while she’s being strangled by her two adorable sons (one which I think was in The Master’s Sun). When Soo Kyung arrives at Kyung Mi’s house, she witnesses yet another argument between her best friend and her husband. After all the arguing ends, Kyung Mi suggests that Soo Kyung go out and meet someone during the weekends instead of just staying inside her house. Back at the apartment building, Jin-yi and Goo Dae-young meet each other for the first time. After exchanging greetings where she calls him (Jjang jjang man which means best best guy! ), a man that she hired to hang her clock arrives. Just when she was about to pay the man $23 dollars, our amazing Goo Dae-young steps in and volunteers to do it himself for $10. After hanging her clock for her, Goo Dae-young finds out about her dad and yet, another dream of Jin-yi’s which is to live alone. They converse for a little until Jin-yi asks to take a picture with Goo Dae-young Oppa so she can post it on Twitter and Facebook (no kidding). The first take isn’t to Dae Young’s approval as he states, “Take it again. I look weird.” LOL. Lee Soo-kyung arrives back at the apartment after visiting Kyung Mi and while passing by Room 804, smells the sweet aroma of black bean noodles only to find Goo Dae-young and Jin-yi eating the black bean noodles inside of Jin-yi’s apartment. While Dae-young and Jin-yi are preparing to eat the noodles, Jin-yi brushes off all black bean noodles, sweet, and sour as similar which offends Dae-young, leading him to describe each noodle dish so descriptively. After watching the two eat the black bean noodles so deliciously, Soo-kyung grows some interest in the black bean noodles and tells herself that she has to get that the next time. Later on that night, while Dae-young and Jin-yi are out doing their own things, we have Soo-kyung who can only look sadly at the food that is presented on the food t.v. show she’s watching. While watching the T.V. show in her apartment by herself, she grows suspicious because it seems like someone is trying to break into her apartment. However, it only turns out to be Jin-yi who is wasted after a whole night out partying. Soo-kyung drags Jin-yi to her apartment door and goes back to minding her own business when she suddenly thinks about the woman that had passed away in Apartment 804. Worried, Soo-kyung goes back outside only to find Dae-young holding Jin-yi while trying to enter his apartment. This causes Soo-kyung to misunderstand and grow mysterious at Dae-young’s actions. Soo-kyung has no choice but to take the drunk Jin-yi in the end since she won’t allow Dae-young to. Jin-yi ends up puking that night and is found in Soo-kyung’s bathroom the next morning, lying on the floor. She finally wakes up conscious and thanks Soo-kyung for taking care of her. The next scene takes place at Soo-kyung’s work place which is a lawyer’s office. 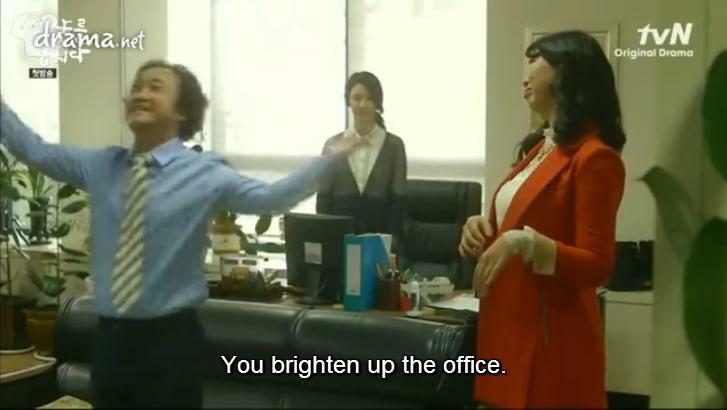 There are four people that work at this office, including Soo-kyung herself, Kyu-shik who is also Kyung Mi’s husband, Do-yeon a lawyer, and our second lead male Hak-moon who is also another lawyer. Lawyer Hak-moon enters the office only to receive compliments by Kyu-shik and Do-yeon about how great he was on T.V. the other day. However, all he can do is scold Soo-kyung for not watching him on T.V. and says that he’s tired, though he won’t allow Lawyer Do-yeon go on T.V. Dae-young (who is looking mighty fiinnneeee in a suit btw) coincidentally meets Jin-yi in front of the dry cleaning shop. They talk for a bit while about the incident yesterday concerning drunk Jin-yi then decide to go to Gangnam together to shop for some matresses for Jin-yi. After some shopping, Dae-young advises Jin-yi to just live simply like how he does: use a blanket as his bed. Yes, yes, that’s the right and easy way to live. Hehe. Soo-kyung is asked to attend the hearing for one of the cases so once she gets there, the old lady that had hired Lawyer Do-yeon yells at Soo-kyung because she didn’t win the case. After defending Lawyer Do-yeon, she receives a phone call from the same guy that was her blind date in the beginning of the drama. Together they dine out at the mat-jib restaurant that he left her at last time. He apologizes for leaving her so rudely last time and makes up by inviting her to eat with him at the same restaurant. 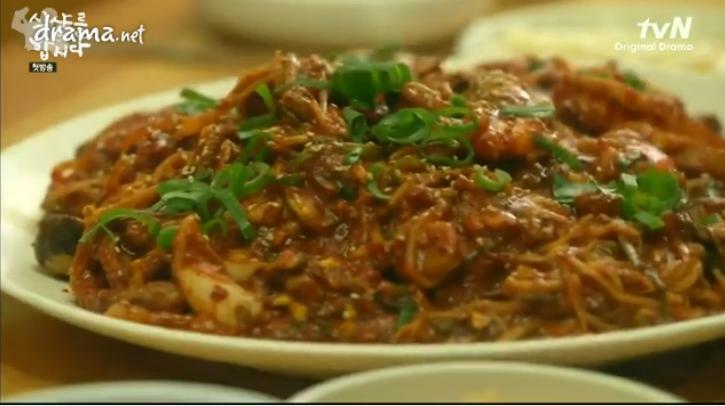 The popular dish that Soo-kyung craved so badly last time to eat but couldn’t because she was alone finally arrives at her table and she starts digging in after getting permission from her blind date. She can’t contain her excitement and happiness as she quickly eats the dish so deliciously that her blind date is amazed at her eating skills. (Priceless face expression btw, lolol). But he excuses her eating the dish quickly by blaming himself and they continue to eat. Soo-kyung’s blind date drops her off at her apartment building, but uses the excuse that he needs to use the restroom just to visit her apartment. After entering Soo-kyung’s apartment, he states that he suddenly feels better and thinks that there must be a reason as to why Soo-kyung let him enter her apartment when there are public restrooms all over the town. He tries to kiss her next and even pushes her onto the bed but she fights her way out of his hold and starts naming the consequences he’ll receive for sexually harrassing her. He runs away in fear while Soo-kyung yells at her manager Kyu-shik for setting her up with such a bad guy. They meet at a club where she goes crazy over how he could set her up with a guy like that. While complaining, her hair lands in the boiling water. Afraid that her hair would burn, Kyu-shik tries to remove her hair but Soo-kyung views it as an act of sexual harrassment and also threatens Kyu-shik that she’ll sue him. After creating a hassle at the bar, Soo-kyung returns to her apartment building only to puke in front of her apartment building from all the drinking. Dae-young and Jin-yi who are cleaning outside in the hallway can only watch Soo-kyung in disbelief. The episode ends with Dae-young finding a solution to clean up the mess Soo-kyung made and Soo-kyung resting while lying on the floor in her apartment. Fast forward a few more seconds into the episode before the woman that had lived in Apartment 804 had died and you see Dae-young entering her room with her while carrying a black bag with him. What could this possibly imply? That maybe he might have murdered her since he was the last person with her? 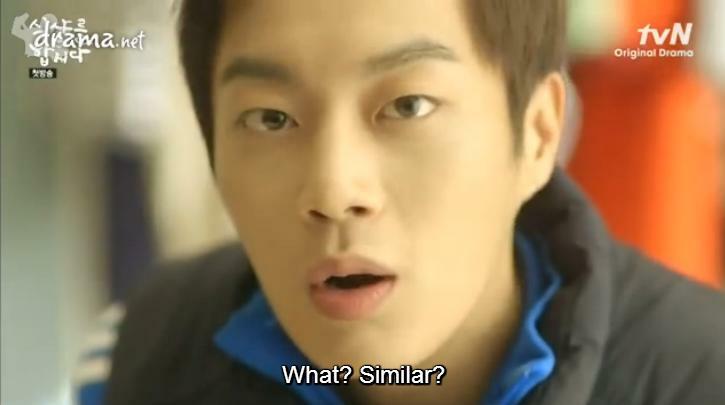 WUT DOOJOON OPPA. YOU WOULDN’T DO A THING. It’s been a few months since I watched the first episode, so I can’t really remember how I felt about the first episode and drama overall, but after doing this recap, I can say that I’m glad I did it because it certainly does clear up some things that the drama revisits in the later episodes (you’ll understand me when you watch the later episodes). The first episode isn’t anything amazing that makes you want to keep watching it; in fact, I would even call it boring. But I decided to stay with this drama because of Doojoon, for the food, and to see how things will unfold. Will the mystery behind the murder ever be solved? The drama has been setting up Goo Dae-young as the possible murderer so is it really him that is the murderer? What will happen to all three of them in the future? I have only watched Lee Soo-kyung in one of her dramas ‘Soul Mate’ and didn’t really recall anything about her in that drama. Seeing her here is refreshing and nice, because I like her character and how she sticks up not only for herself but also for her co-workers. You guys already know that I’m extremely biased towards Goo Dae-young (because the amazing Yoon Doojoon plays him) but if it does turn out that he has something to do with the murder of the woman in Apartment 804, I will be really mad and may even come to disliking his character. But so far, he’s a really funny, witty, flirtatious, but mysterious guy. My initial impression of Jin-yi / Yoon-jin wasn’t so good when I saw the first episode. I viewed her as one of those preppy, pretty, ignorant girls who falls for things easily, but it isn’t until the later episodes that I realized there was something about Jin-yi that’s really charming and cute. As for our second male lead Lawyer Hak-moon, not too fond of him either but we’ll see what happens in the upcoming episodes. what game is goo daeyoung playing in the first episode on his phone?